The basic model of the Snom business telephone family, the Snom 300, fulfils the most important requirements of VoIP telephony and additionally offers numerous functions that are indispensable in the business world.For effective everyday work, the Snom 300 provides all relevant office functions such as choice of trunk line, status display, group lines, the engaged option or picking up calls. A server-independent CTI now also works with the Snom 300. A two-line LCD enables the display of call information. The menu-driven user interface makes it very easy to manage numerous features. The user is guided intuitively through the phone menu via the navigation key.Additionally, more complex phone applications, call details, and configuration variations are accessible via the browser of the connected PC. The snom 300 has six free function keys.The advantage for the user: He or she can freely decide what functions like hold, call transfer, call forward, or access mail box to map onto these keys. For other available functions please see the data sheet. The snom 300 is designed for different environments: For use in small offices, call centers, lobbies, recreation rooms, as well as at home. With its numerous phone functions, the demands of everyday communication can be managed easily. The snom 300 has a headset connector and can be used as a tabletop phone or wall-mounted phone. Its energy consumption of 1.0-1.5 W/hr is lower than that of most competing products. 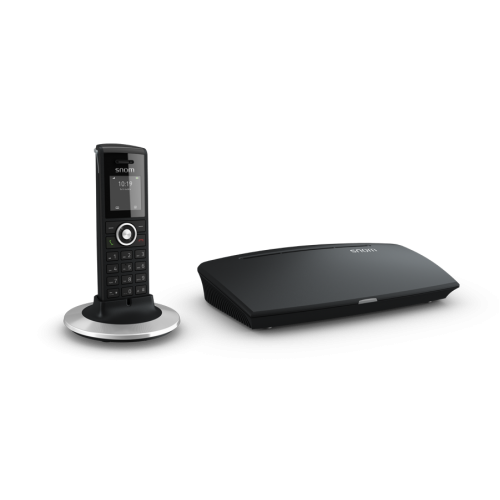 The Snom M25 DECT Handset is designed for professional business use. The M25 DECT handset ..